The Magic Button heavy duty garage door motor offers an ideal motor for sectional overhead doors where the application requires intensive use and a high duty cycle garage door such as the Liftmaster sectional garage door, Australia's premium high cycle door. Built to last the unit features strong compact mechanical components and a robust and effective and adjustable clutch. All sprockets, idlers, limits,bearings and rollers are selected to provide a most robust package. The motor is available in either 240V or 3 Phase 415V for continous operation. The motor is suitable all applications where intensive use conditions apply such as, high rise office towers, apartment buildings and commercial warehouses. Electronic control of the motor is by way of the exclusive “Magic Button” performance control board MB106 which is conveniently housed either with the motor or in a plastic or metal control box. The Magic Button control board offers unrivaled flexibility in the selection of operation modes suitable for any application. 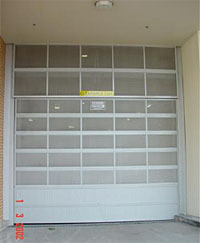 The Liftmaster heavy duty, high cycle sectional garage door is the ideal security solution for busy car parks such as, high rise office towers, apartment buildings, parking stations,commercial and industrial estates, warehouses and parking stations. The Liftmaster door range has been specifically engineered as a functional decorative element providing extreme strength, speed and durability. The range of profiles available include grille, louvre, showroom acrylic, fire station, classic B & C, geometric, LV16 and many more. 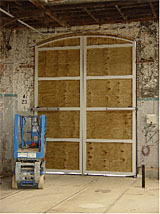 The doors can be supplied in various sizes up to 7500mm wide and 3800mm high. 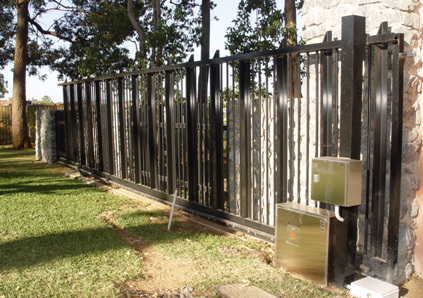 Other components include powder coated counter balance springs and heavy duty door hardware in either standard, low headroom or independent torsion with torsion or overhead drive motors. The ideal drive motor is the Liftmaster overhead motor model 525/505 and electronic control of the motor is by way of the exclusive “Magic Button” performance control board MB106 which offers unrivaled flexibility in the selection of operation modes suitable for any application and associated safety devices such as vehicle detectors. The Magic Button hydraulic oil bath slide motor offers an ideal motor where space is at a premium and the application requires the installation of a high duty cycle heavy swing gate. Built to last the unit features strong compact mechanical components, enhanced resistance to atmospheric agents with a motor oil bath to allow heat distribution with a quiet and smooth operation. The motor is suitable all commercial and premium residential developments. Electronic control of the motor is by way of the exclusive “Magic Button” performance control board MB206. 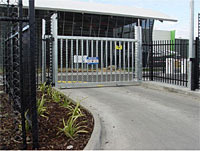 Features include among other features, leaf delay, pedestrian opening and electric lock output with shunt. The electronic control is conveniently housed in a secure plastic control box with sufficient space to mount other control devices often used for intercom or the fitting of mandatory safety devices. The Magic Button control board offers unrivaled flexibility in the selection of operation modes with the added feature of soft stop and soft start. The Magic Button hydraulic oil bath slide motor offers an ideal motor where space is at a premium and the application requires the installation of a high duty cycle heavy slide gate. Built to last the unit features strong compact mechanical components and a permanent oil bath to allow heat distribution. The motor is suitable all commercial and premium residential developments. Electronic control of the motor is by way of the exclusive “Magic Button” performance control board MB106 which is conveniently housed under the motor cover to make installation easier and faster.